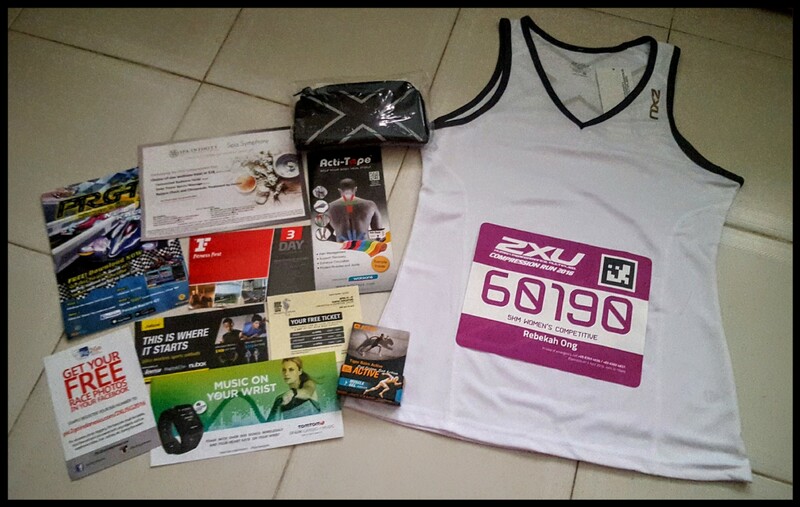 Race Review: 2XU Compression Run 2016 [5 Km] (by Rebekah Ong) | JustRunLah! 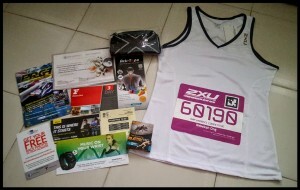 The annual 2XU Compression Runs is one of my favourite run events and I always look forward to joining this event! This year I signed up for the 5km category and since I was a Past Participant, I was entitled to loyalty rates. I really appreciate when the organisers have loyalty rates for past participants as cost is a big consideration factor when I sign up for races. The first two items from the above list were crowd–pleasers but for the sponsored items, sadly, I can’t say the same. 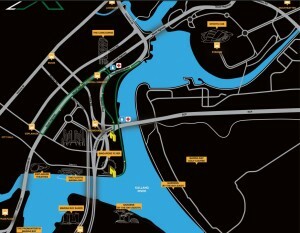 Here are my thoughts on the organisers could do better for the race pack. For the sponsored Garnier product for men, it would be nice if the they had a ladies option too. 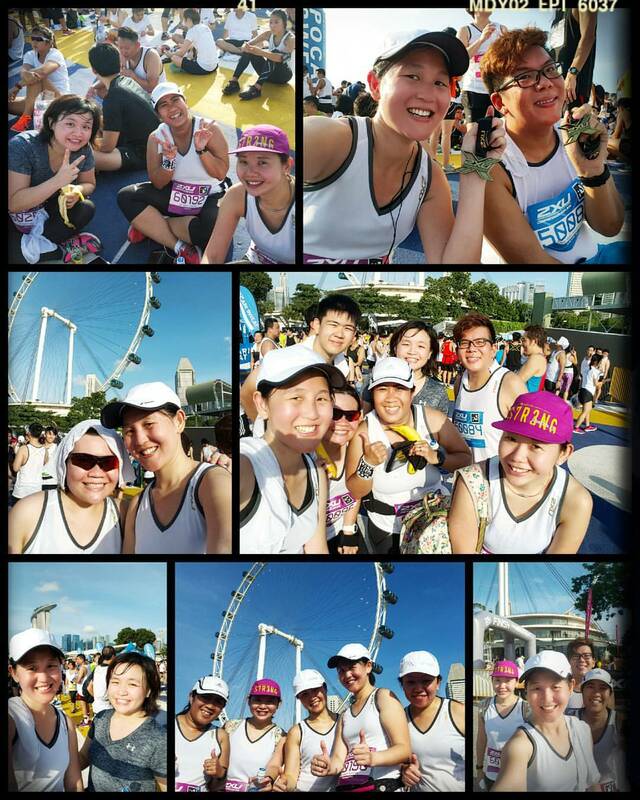 The race pack collection was done by my friend, Pearleen. She went to collect the race pack on the first day around 11:30hrs. There was not much of a people and the queues were moving fast. Overall, it wasn’t a long wait and collection was smooth. Kudos to the organisers on a good job done. The 5 km race category flag off timing was 07:30 hrs at the F1 Pit Building. 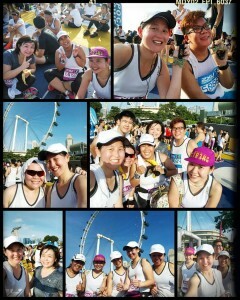 My friends and I had decided to meet up 06:45 hrs at Promenade Station and walk to the race site. 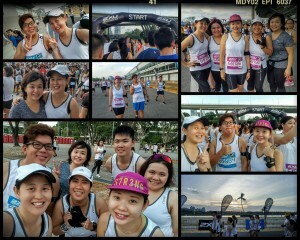 It was a very warm morning and we were perspiring even before the run had start. We were also glad that there wasn’t any burning smell in the air as the past few days had been hazy! One of my friends had to deposit her bag at the bag deposit area and that didn’t take her very long. Service at the bag deposit was really fast and efficient according to her. 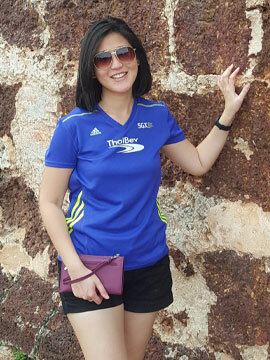 After she returned to the group, we took some photos around the pit building before heading towards the start Pen. At around 07:20hrs, the race pen was still not open for the 5 km runners to enter. This surprised us although as they were still allowing 10 km runners to enter the race. 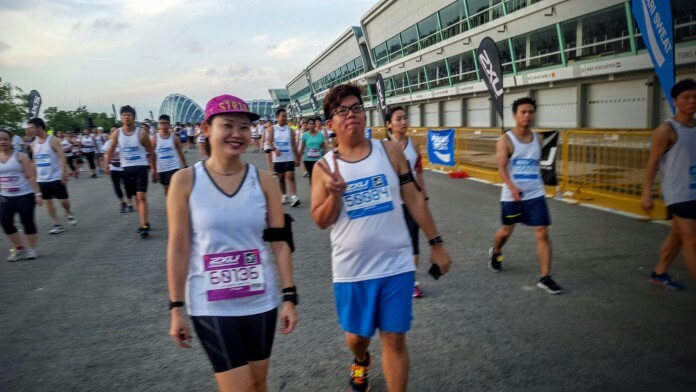 I know it’s written on the website that participants who do not start within the 30 minutes from their respective flag off point would be disqualified/ may not be allow to start but the organisers could have catered a different entry point for them while allowing the 5 km participants to form up. I felt that this arrangement could be improved when especially they had other events lined up for the 5km runners before flag off. The 5 km flag off was delayed to 07:40 hrs. We had arrived early so that we could start on time and avoid the morning heat from the sun. Eventually we made our way into the START Pen for the 5km flag off. I was pretty pleased to be starting off so near to the front. This was also my first time being so close to the START line and being flagged off in the first wave. The warm up dance session was conducted to some upbeat songs like ‘Happy’ by Pharrell Williams and ‘Uptown Funk’ by Bruno Mars but some of the participants were already frustrated by the late flag off and didn’t seem too enthusiastic. I personally thought it was fun but they should have started earlier. Finally the signal for the race to START was given and all of us were more than happy to started the race! The route for 5km was a pretty easy one as there was not much slopes. 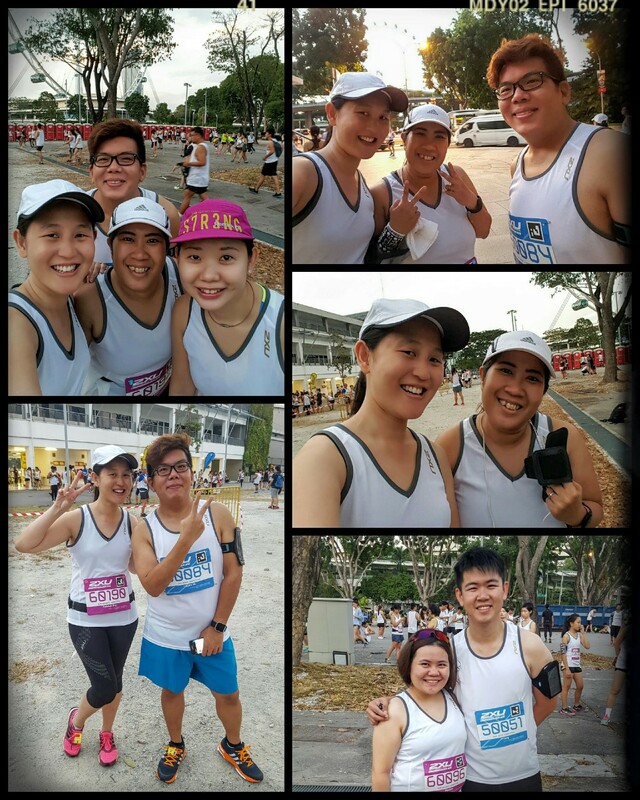 There was also no bottlenecks and it was a really smooth run but the sweltering heat made it challenging. Proper signage markers throughout the route so that participants would know how much they have covered. More water points to be distributed along the route as it was a really warm day. 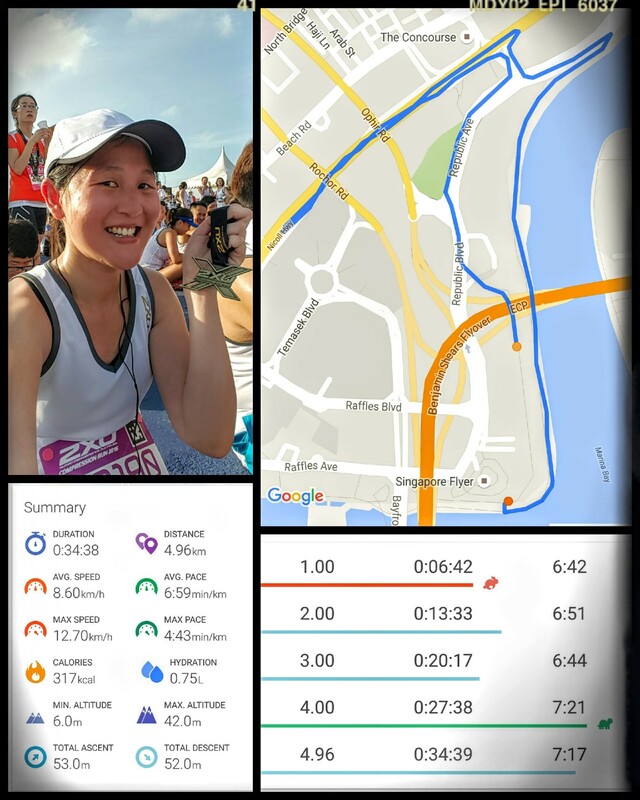 I completed the race in 34 minutes which I think is one of my better timings so far. The organisation for this part of the event was smooth though there was a long queue forming. The queue moved fast, so that’s always good. My friend Calvin feedback that an improvement area would behaving better signage/banner at the top of the tents to show where to queue to collect the medals. On that day, there was only a written piece of signage right at the entry of the queue. The poor auntie who was volunteering had to raise her voice to get people to the right queue. Overall, we were all happy that we completed the race in good time. 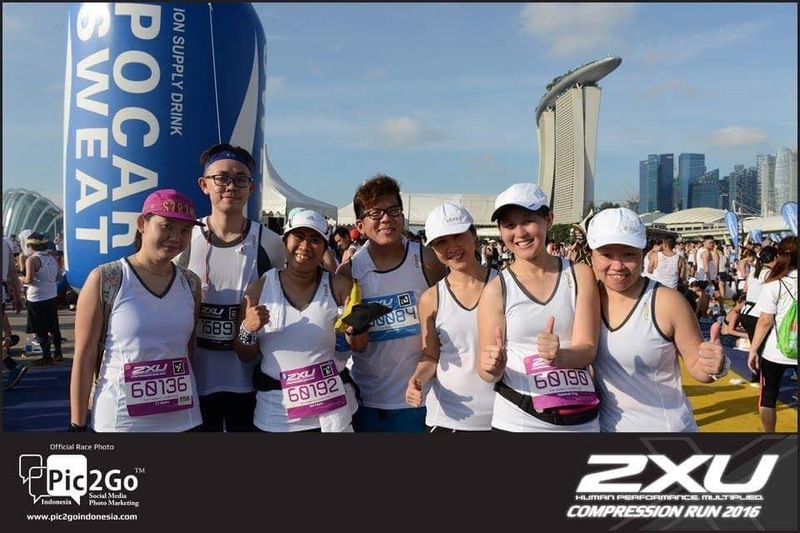 We definitely enjoyed the overall race experience of the 2XU Compression Run and look forward to the 2017 edition! Hope you guys enjoyed reading this review as much as I enjoyed myself yesterday during the event!